These words are from an article published by the New York Times (NYT) a few days ago. The article describes how electricity generated by harnessing Iceland’s extensive renewable energy sources may possibly be exported to consumers in the European Union (EU). 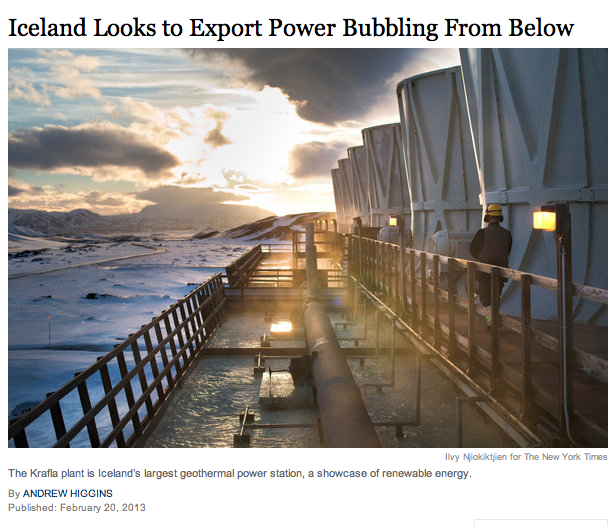 Such an export could result in a very substantial increase in profits for the generating companies in Iceland. The aluminum smelters are paying prices believed to be less than 30 USD per MWh. Which is, according to the NYT, less than half the going rate in the EU and barely a quarter of what, according to the Renewable Energies Federation, a Brussels-based research unit, is the average tariff, once tax breaks and subsidies are factored in, for renewable electricity in the EU. Currently, Landsvirkjun is conducting a research into the possibility of a submarine electric cable (a High Voltage Direct Current cable or HVDC) to connect the electricity markets of Iceland with the European market. The cable would be approximately three times longer than the link between Norway and the Netherlands, which is currently the world’s longest submarine electricity cable. It is to early to say what would be the preferable connecting point in the EU; it could be Scotland, the Netherlands, Germany, or even Norway. A connector between Iceland and Europe would not only offer the Icelandic electricity generating companies the possibility of substantially higher price for their product. Such a cable would also make it possible to import electricity to Iceland in periods of low electricity prices at the other end of the cable (such as during the night). The connector would also increase the energy security in Iceland, as the country would be less dependent on keeping large emergency reserves, as it does now. For the EU this would also be an attractive project – not least as the Union’s 27 member states agreed in 2009 to a mandatory target of deriving at least 20 percent of its energy from renewable sources by 2020. It is expected that final decision on the cable will be taken within two years or so. For more information about the cable and the importance of EU’s energy policy for Iceland, please check out our earlier post on the issue. Last Thursday, the Icelandic power company Landsvirkjun started the operation of two wind turbines close to the Búrfell Hydropower Station in Southern Iceland. These are the first large wind turbines in Iceland. The wind turbines each have a 900 kW capacity (1.8 MW of installed power in total). Together their generating capacity could be up to 5.4 GWh per year. The masts reach a height of 55 metres and each spade measures 22 metres in length. When the spades are at their highest position the unit will achieve a height of 77 metres. The wind turbines are produced by the German company Enercon (model Enercon E-44). Enercon specialises in manufacturing direct-drive wind turbines, where the the generator produces electricity with fewer turns and thus reduced mechanical stress, increased engine life and reduced energy loss and noise. The turbines operate at or around full capacity at wind speeds of 15-28 m/sec. Below 3 m/sec and above 34 m/sec, electricity generation stops. They connect to an 11kV underground electric cable running along a road towards Búrfell Hydropower Station. All additional electricity- and data cables are underground, in order to minimize environmental impact. 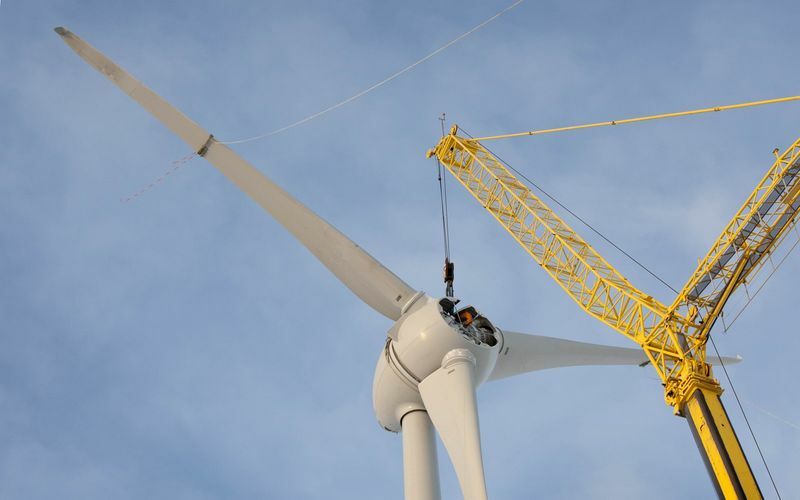 The turbines are located in an area with quite stable winds, with medium wind speed of 10-12 m/sec (stronger in winter than summer) at mast height (55 m). The towers and equipment were erected in last December (2012). Since then, Enercon has carried out and completed necessary tests for the project. Now the project has been handed over to Landvirkjun, and the turbines formally started operating. Their generation can be followed in real time at Landsvirkjun’s website. There are a number of areas in Iceland that show great potential for the successful utilisation of wind energy. 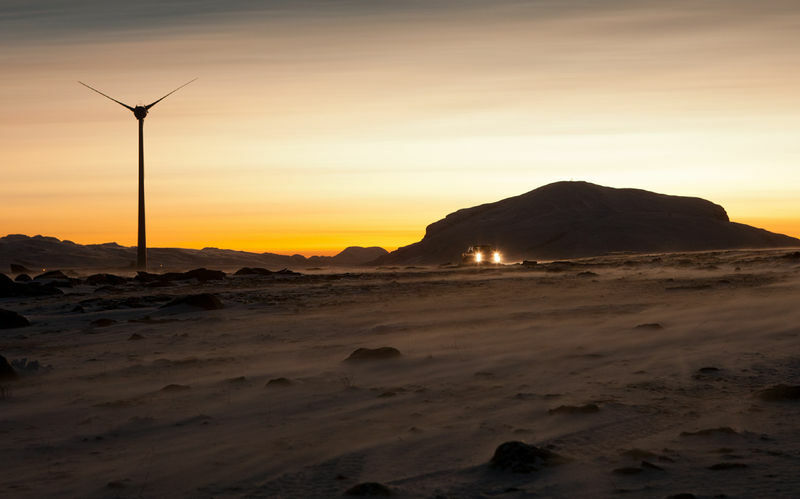 The project is part of Landsvirkjun’s research and development project on the advantageous of wind power in Iceland. 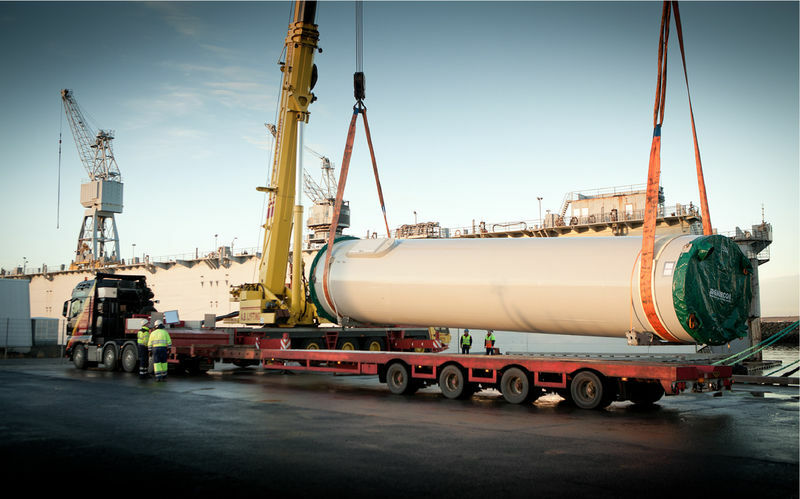 The main objective of the project is to obtain operational experience with wind turbines far inland and in the Icelandic climate. Various climatic studies will be carried out during operation, including wind measurements and research on icing, the impact of snow, ash and soil erosion as well as the effects on birds and other wildlife. It is also of nterest, that the Icelandic Meteorological Office, Landsvirkjun, the Icelandic Icelandic TSO Landsnet and the University of Iceland are all participants in a special research project called Icewind ,supported by the Nordic Top-level Research Initiative and the Nordic wind energy industry. The project objectives, related to offshore wind, include resource mapping near Iceland and improved land-wind resource map such that full-scale studies can be carried out on the integration of hydro- and wind power in Iceland. This may offer new and very economical opportunities to increase renewable electricity generation in Iceland. In 2007, a benchmarking study by PricewaterhouseCoopers (PWC) showed Iceland to be a favorable location for new data centre activity. The report concluded with Iceland being supportive and welcoming in the respect of issues as governmental legislation, immigration and permits. Operational cost for data centres in Iceland is minimum due to the low cost cooling and electricity. Presently, the Icelandic power company Landsvirkjun is offering electricity contracts at the price of 43 USD/MWh. Those competitive rates are available as fixed for up to 12 years. Furthermore, Iceland has significantly less of a security risk than almost any other Western or emerging countries. Its geographic location, low population density and lowered post-Cold War strategic value make it an unlikely target for either external or internal forces. The Icelandic infrastructure for telecommunications networks and services is highly advanced. Mobile phone and Internet penetration in Iceland are among the highest in the world. Iceland is linked with Europe and North America via number of fiber-optic submarine systems. They are Farice-1 to the UK (with a capacity of 0.72 terabits per second and was originally installation in 2003), the Danice cable to Denmark and the Netherlands (with a capacity of 5.1 terabits per second), and Greenland Connect which connects Iceland to Canada and the Northeast United States (with a total capacity of 1.9 terabits per second). 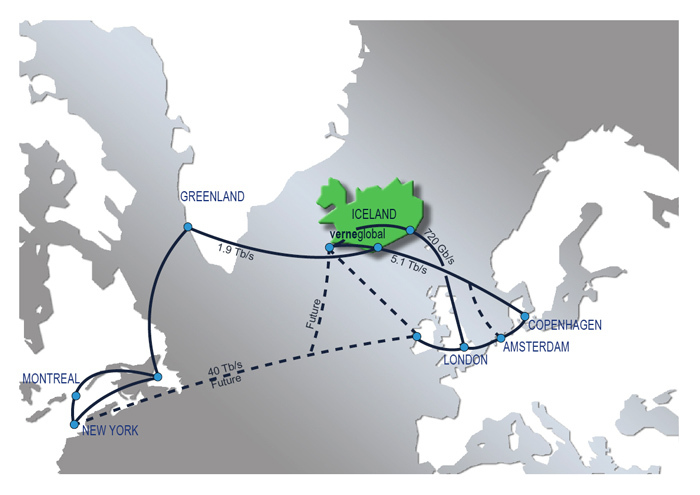 Additionally, the new Emerald Express trans-Atlantic cable (with a connection to Iceland) is scheduled to be ready for service before end of this year (2013). Verne Global is a company that owns and operates a data center campus in Keflavik in Southwest Iceland. The 18-hectare (approximately 45-acre) Verne Global data centre complex is just west of Reykjavik, the capital of Iceland, minutes from Keflavík International Airport. Verne Global’s facility has been designed to fully utilise Iceland’s unique environmental power advantages: 100% powered by renewable energy resources and 100% cooled by the natural environment of Iceland, without the use of chillers or compressors. The largest investor in Verne is the UK investment foundation Wellcome Trust. Verne Global offers data centre decision makers a 100% carbon neutral and affordable power solution with a very precise pricing predictability, a range of server density options and efficiency without extra expense, using natural cooling. The customers of Verne Global customers range in size from those requiring multi-kilowatts to multi-megawatts. With its headquarters in the United Kingdom, Verne Global is led by an experienced team with proven success in the data centre industry. Thor Data Center (THORDC) in Hafnarfjordur is owned by the Nordic IT company Advania. The Thor Data Center facility is located 10 minutes from Reykjavik, and a 30 minute drive from Keflavik International Airport. Due to the physical and natural elements in Iceland and the specific datacenter design, Thor Data Center is claimed to be one of the most energy efficient data centers in the world. It is powered by clean renewable hydro- and geothermal energy sources and offers unique value proposition for companies demanding a reliant and cost effective hosting service in a 100% green, zero carbon footprint environment. Recently, the Commission of the European Union (EU) awarded more than EUR 1.2 billion to several highly innovative renewable energy technology projects within the EU. One of the selected projects is Hungary’s first Enhanced Geothermal System (EGS), with the participation of Icelandic engineering firm Mannvit. The Hungarian EGS project was selected by the Hungarian Ministry of National Development amongst a series of project proposals to participate on behalf of Hungary in a special programme called NER300. The NER300 programme is one of the world’s largest funding programmes for innovative low-carbon energy demonstration projects. The programme will act as a catalyst for the demonstration of environmentally safe carbon capture and storage (CCS) and innovative renewable energy sources (RES) technologies on a commercial scale within the EU. The programme is run by the European Comission on member state basis. It is funded by the sale of 300 million emission allowances from the New Entrants Reserve (NER) set up for the third phase of the EU Emissions Trading System (ETS). NER300 funding is expected to leverage a considerable amount of private investment and/or national co-funding across the EU, boost the deployment of innovative low-carbon technologies and stimulate the creation of jobs in those technologies within the EU. The project Mannvit is participating in is led by a consortium formed by Mannvit Hungary and EU-FIRE, which is a Hungarian real estate investment and consultant company. Mannvit Hungary is a subsidiary of Mannvit in Iceland, the veteran leader in geothermal power development with decades of experience in developing geothermal resources. The consortium is in a close cooperation with the Hungarian Ministry of National Development. Further development and execution of the project will require input from various engineering and scientific partners, both international and domestic. The project was awarded almost EUR 40 million, while the total investment cost amounts to over EUR 100 million. This is a pioneering endeavor of creating a commercially viable geothermal resource for power generation in hot dry geological formations in Southeast Hungary. Geothermal energy systems constitute a sustainable source of electricity that is almost entirely free of greenhouse gas emissions. The Hungarian EGS project will produce electricity in an environmental friendly and sustainable way. The project will also provide various opportunities to strengthen the community with prospects in the fields of long-term employment in various sectors, knowledge transfer and development of secondary green industrial or horticultural development projects that will support social and economical development in the area. The EGS technology that lays the foundation of the project has an enormous potential to become an important contributor to the energy portfolio, not only in Hungary, but in the greater part the South Danube Region of central Europe. It represents a source of clean and renewable energy and thereby facilitates the EU goal that 20% of the energy use is to be from sustainable renewable energy sources by 2020. The Icelandic engineering firm Mannvit offers wide range of services in the fields of engineering, consulting, management, operations and EPCM contracting. The company was founded in 1963 and is employee-owned (more than 100 shareholders). It has headquarters in Reykjavik and branch offices or affiliates in Hungary, United Kingdom, Germany, Chile and the USA. Other projects and activities by Mannvit on the European continent include mapping of geothermal potential in Serbia and deep drilling exploration project in Slovenia with the purpose to produce electricity. Also, Mannvit is developing geothermal possibilities in Bosnia and Herzegovina. More information about Mannvit can be found on the company’s website.